Canine heartworms are enough to put the fear of God in our own hearts. Who wants to think that the dog might have his precious heart full of nasty, life threatening worms. The heartworm is a type of roundworm. The picture below is enough to make you sick, isn't it? But let's calm down and look at the whole topic reasonably, so we can keep are sanity. Healthy heart on the left. 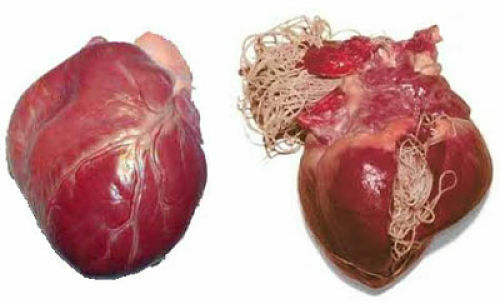 Heartworm infested heart on the right. Here are a few need to know facts about heartworms in dogs. 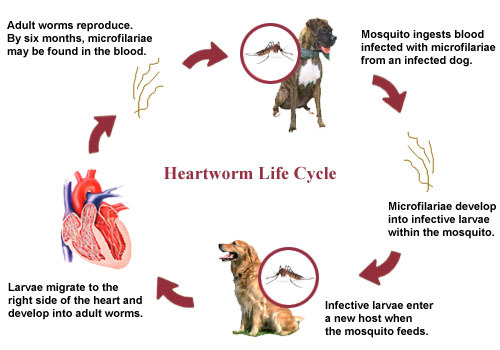 This where it gets difficult, because heartworm symptoms in dogs typically do not show up for a long time, usually at least six months after being infected with the larvae called dirofilaria immitis. During this time the larvae mature into adult worms, mate and then give birth to more little microfilaria. The mosquito is the required intermediate step here. 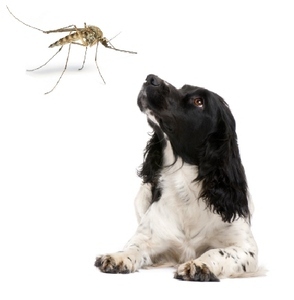 The mosquito bites an infected dog and carries the larvae to the next dog it bites. Then the cycle continues. The diagram below explains this very well. Since heartworm preventative ' meds ' are toxic chemical insecticides, it would be wise to weigh your dog's risk for infection. 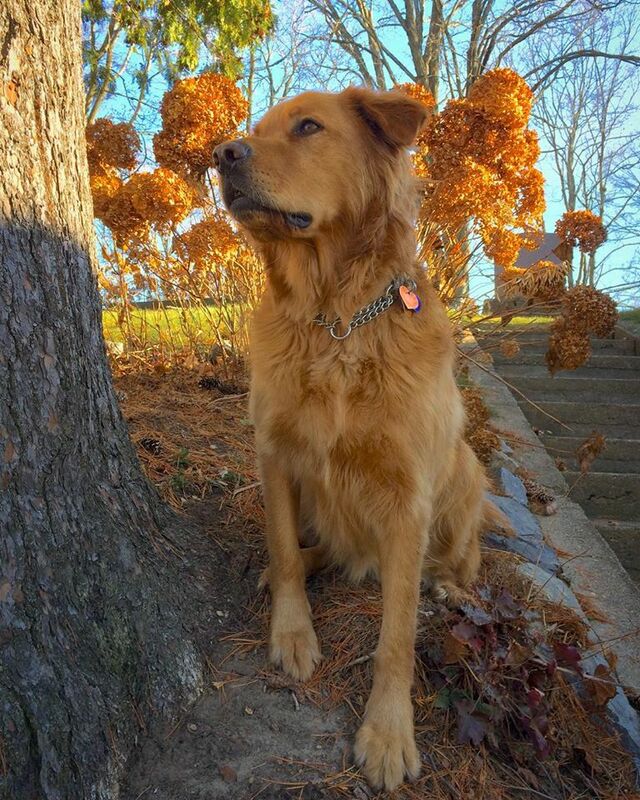 Is your dog at risk, and how high is that risk? Much of that risk analysis will depend on where you live. If you live in a high risk area of North America you might want to consider this treatment at low minimum doses. If you live in a low risk area, and your dog is a house pet, do you need to use these chemicals at all? Here's a map put out by the Companion Animal Parasite Council which will tell you accurately how much risk you have for your particular area. The further north you go, the lower the risk. Canada is considered very low on the risk scale for heartworms. Although I always advocate natural remedies where possible, in all truth, this is one topic where I find natural solutions don't work very well. 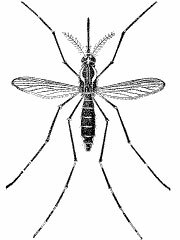 That is because the little microfilaria are deposited in the dog's blood by the mosquito. This is different than other types of parasites and parasitic worms which usually are ingested, pass through the digestive tract and enter hatch or break open in the intestinal environment. I don't want to sound like a pessimist here. Just want to be truthful. 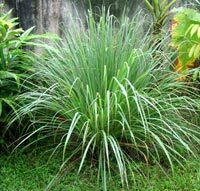 I very much believe that the best way to prevent this problem is by doing your best to repel mosquitos and the use of antiparasitic herbal remedies does offer additonal support here. My suggestions for insect repellants including mosquitos, are all natural. Get rid of this guy. It's all his fault. Prevent mosquito bites. That's the best preventive for heartworms.